My Alice in Wonderland Nursery Idea was inspired by the book. 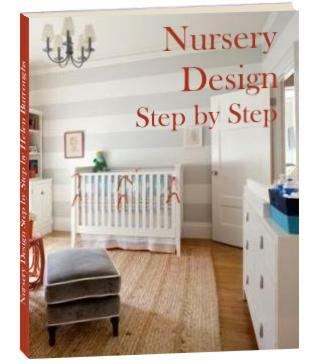 The nursery project kept me sane while I was stuck at home for a month due to some complications in my pregnancy. My husband helped me to stick up anything too high and to pick up anything that I needed at the store. I used a Red, Black and White color palette. 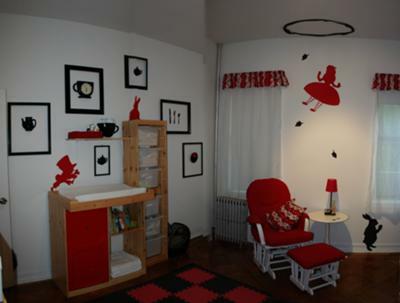 We could not paint the nursery walls so I created Alice silhouettes from sheet neoprene and adhered them to the wall using double side sticky tape. We purchased most of our furniture from IKEA, including the crib in a plain pine finish. The glider is from Babies R Us. I purchased an Alice in Wonderland cotton print from superbuzzy.com to make the pillows and valances from. For the glider I created slip covers out of a soft canvas from Jo-Ann Crafts. That same canvas was used to make soft storage boxes (you can see one on the shelf over the changing table). The lamp and table are from IKEA. I added a tiny box full of fake cookies (eat me) and a small bottle of faux liquid (drink me) on the lamp base to personalize it. The flooring is rubber black and red tiles from softtiles.com. I purchased tea party related objects, wall pockets and some picture frames on ebay and from local thrift stores. All of them were spray lacquered a matching black. The storage is mostly in the closet of the room. Lots of plastic storage bins with DIY Alice labels saying what they contain. All items that will be used often and the baby clothing have a place in the IKEA organizer around the changing table or in the silhouette wall pockets. To keep loose items organized I created some red canvas boxes. I LOVE THE ALICE IN WONDERLAND THEME for the nursery! It's such a fun theme and so many possibilities. Just wondered if you'd like to check out the Alice in Wonderland scrapbook I have listed on Ebay. It's the first installment, with more pages to come. Hope you like it and best of luck with the upcoming child rearing. I have a 2.5 year old and am due again in Jan. Kids make life worth living but boy do they know how to push your buttons to- gotta love 'em! Feel free to mention it to any other Alice lovers that you know. I made the cut outs myself out of sheet foam (neoprene) from the local art store. I found pictures that I liked, blew them up to the right size, printed them out and traced them onto the foam. Email me at katy.monthei@gmail.com if you'd like and I can send you my templates. My husband and I were also thinking of doing an Alice and Wonderland theme. Where did you find your cut-outs? Your nursery is beautiful and so original - I love the framed teacups and teapots! Thanks for sharing.